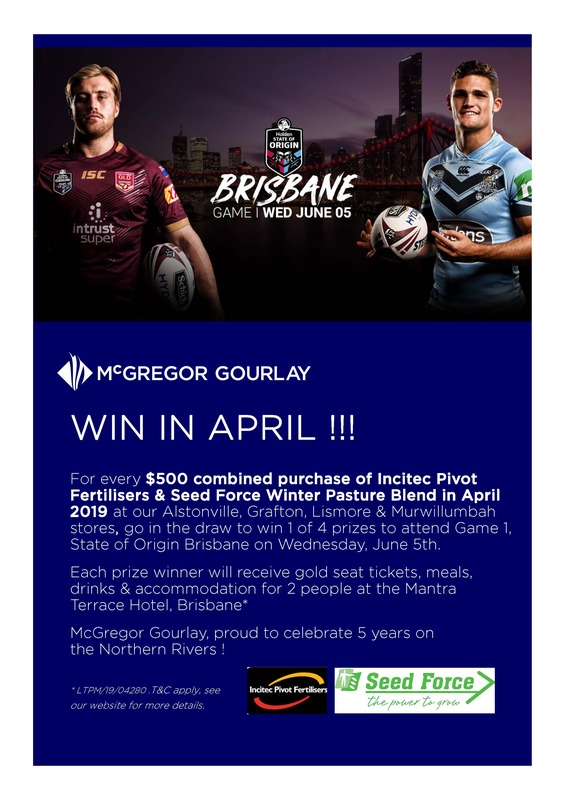 CALLING ALL NORTHERN RIVERS GROWERS – WIN TICKETS TO GAME 1, STATE OF ORIGIN BRISBANE WHEN YOU BUY FROM MCGREGOR GOURLAY ALSTONVILLE, GRAFTON, LISMORE AND MURWILLUMBAH IN APRIL !!! For your chance to win, call in and order your pasture blend today. McGregor Gourlay, proud to celebrate 5 years on the Northern Rivers. Proud to celebrate 122 years of people, business and a new era of farming innovation. * T&C apply, see below for more details…. McGregor Gourlay is offering customers the opportunity to enter a draw for the chance to win one of four (4) national prizes, when $500 or more of Seed Force Winter Pasture Seed together with Incitec Pivot Fertiliser is purchased in the one transaction from McGregor Gourlay Alstonville, Grafton, Lismore and Murwillumbah stores between April 1,2019 and April 30,2019. The “McGregor Gourlay Northern Rivers – 2019 State of Origin Competition” commences on April 1, 2019 and ends on April 30, 2019. All product purchases must be made within these dates, with 1 ticket for every purchase of $500 being entered into the draw. The prize consists of one of four (4) x Gift Voucher(s) from M&G Travel Moree in the form of: two (2) Gold State of Origin Tickets plus accommodation and breakfast for two (2) at the Mantra Terrace Hotel, Spring Hill, Brisbane to the value of $1000 each to be won. All purchases must be made with McGregor Gourlay by April 30, 2019. The prizes are not transferable, substitutable or exchangeable nor redeemable for cash. Offer is subject to terms and conditions – conditions apply. Multiple entries are entitled for every $500 of product purchased, i.e. purchase of $500 – one entry, purchase of $1000 – two entries, and upon fulfilling all other terms and conditions*. The draw will take place at 12.00pm [EST] on Friday, 3 May, 2019 at McGregor Gourlay, 419 Frome Street, Moree. Winners will be notified via phone and/or email within 4 working days from the draw and no later than May 10, 2019. The winners will be published on McGregor Gourlay’s website, Facebook and Instagram Stories pages no later than May 10, 2019. Incomplete, indecipherable, or illegible entries will be deemed invalid. Customers must purchase a participating product from McGregor Gourlay Alstonville, Grafton, Lismore & Murwillumbah stores, to be eligible to go into the draw. Tenders, projects and special priced sales are excluded from the promotion. The promotion is run by McGregor Gourlay Rural Services Pty Ltd, 419 Frome Street Moree, ACN 77 169 931 211.